I’m so happy that I got to experience the VAASL Conference. What a wonderful opportunity for librarians to share with other librarians (and librarians to be)! I attended some really great sessions. First I went to a session presented by Lynne Farrell Stover called The Contemporary School Story: A New Nemesis Appears. I heard this presenter at Longwood over the summer when she shared her lessons on Unspoken by Henry Cole so I knew I would enjoy it. She went through a few books that are now incorporating story lines with testing and data. She handed out lesson plans to go along with the titles she shared. I will be able to do some of these lessons in my own class and I’ll share them with the librarian in my school. I also attended a session presented by Elizabeth Kyser and Rebecca Schneeberger called Virginia Readers’ Choice – Primary. 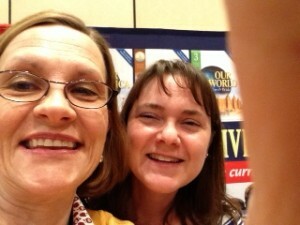 These two presenters went through the newest list of Virginia Readers’ Choice books and talked about how you can use them in your classroom or library. I learned that the books on this list are not necessarily new. I saw titles that I’ve been using in my classroom for years. Uh, why did I not know that? Dee Griffith and Marsha Stewart presented a session on Making the 2014 Elementary Connection: What’s New in Children’s Literature. This session was fast paced with book talks on a lot of new books! I feel like since I’m not using different types of technology in the library yet, I wanted to go to sessions on books. This one was perfect! Oh… the wish list of books I want to purchase! The next session I attended was presented by the one and only Audrey Church – Top Ten Topics and Trends for 2014. I had told myself that I wasn’t going to attend sessions by our professors because they would most likely share this information in our classes at some point. But when I saw the title of this one, I knew Audrey wouldn’t be sharing this in class. This was another fast paced presentation on topics such as augmented reality, digital curation, evidence-based practice, genrefication, library reports, Makerspaces, professional development, project-based learning, and research. Wow! I plan on purchasing a few augmented reality books for my classroom. My students will love them. I also want to learn more about digital curation so I’ll be reading some of the articles Audrey gave us. On Friday I attended NonFicton StoryTime by Gwen Lantz and Margaret Alger. The pair went through non-fiction books and talked about how they used them in the classroom. I got excited about using non-fiction and learned how to read this type of text to engage kids. The story behind Biblioburro: A True Story from Columbia by Luis Soriano was amazing. He had a library on his donkey! I went to a session presented by Susan Morris called Reading Together: Parent/Child Book Clubs. She explained how book clubs are a great way to bring kids and parents together to enjoy good books. She went through the steps on how to start a book club and which books she chooses and why. I probably took the most out of this session because it’s something I’m going to do as soon as I get back to school. I went to a session presented by a very animated Allyson Watkins (I wish she was my teacher/librarian when I was little) called The Math-literature Connection in the Elementary Library. Not only did we learn about good titles to use with math, but also her story about why she had to do so much math in the library was very interesting. By this point in the day I was happily on information overload and went to relax in my room. The keynote with Stephen Krashen was uplifting, dessert with David Baldacci was very entertaining, and dinner with Neal Shusterman was moving. How lucky for me to be able to experience all this in just a few days! I am so looking forward to the next time we all get together as librarians and learn from one another. Fabulous! This was my first VAASL conference and I can sum it up in one word: WOW! It was great fun going to the conference with my library cohort buddy Jenny Larson. I learned a lot in all my sessions…favorites were the ones on technology, primary sources, and makerspaces. I can only wonder when the day will come when I will be able to use all my new ideas when I am hired as a librarian. 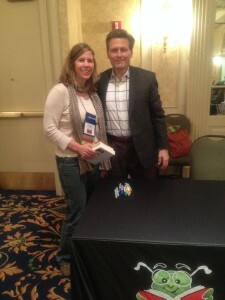 I really enjoyed the dessert buffet with David Baldacci, and yes, library friends out there reading this, he really is the brother of the family who attends my church. When visiting the vendors, I ran into a former colleague of mine and previous Longwood School Librarian graduate student, Leslie Swenson. She now works for Five Ponds Press. In the picture, you will see me to the left, Leslie to the right, the display of Five Ponds Press in the background, and my finger to the far right. I need to practice my selfie technique! A big shout out to Frances Reeve, Audrey Church, and Karla Collins for a lovely reception with introductions by Audrey (amazing!) and the gift!! Thanks to the Longwood Travel Grant for supporting my conference adventure! 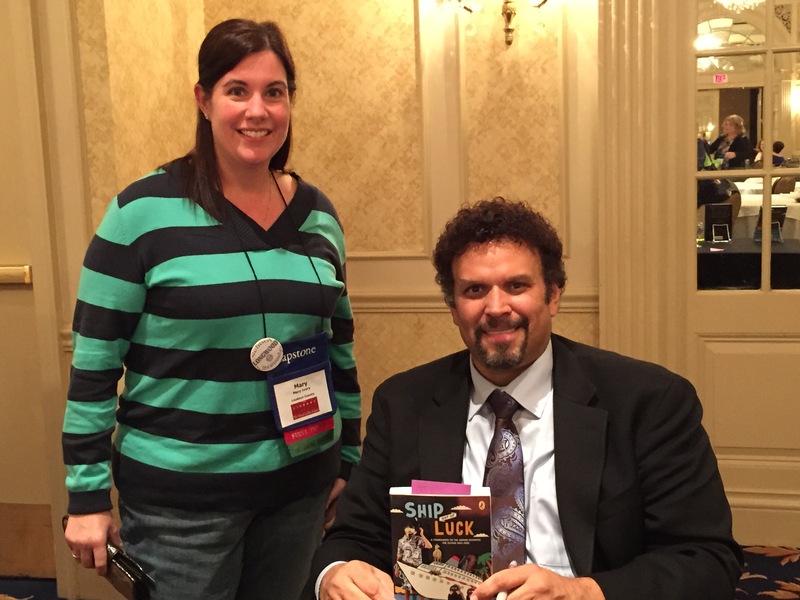 I had such a wonderful time at the VAASL Annual Conference! This was the first school librarianship conference I’ve ever attended and I am so excited to come back next year! Although I was only able to attend for one day, I got to experience all the best that the conference had to offer. I sat in on informative concurrent sessions hosted by some of the field’s best and brightest (AASL Best Websites for Teaching and Learning with Heather Moorefield-Lang, Making the 2014 Elementary Connection: What’s New in Children’s Literature with Dee Griffith and Marsha Stewart, and Top Ten Topics and Trends for 2014 with Audrey Church). I spent time and made memories with my peers from the Loudoun cohort, perused the vendor hall, met up with my former library mentor Dee Griffith (here’s a picture of us from when I was in high school), laughed and ate more than my share of delicious deserts at the reception with David Baldacci, and was duly impressed by the overwhelming support for Audrey Church’s candidacy from the over 140 Longwood University alumni on Thursday night. I attended the VAASL Annual Conference in Roanoke, VA from November 6-8, 2014. This was my first experience at a conference for librarians; however I have attended state conferences for middle school educators in the past. After registering, I immediately began pouring over the conference guide to select the sessions to attend. There were so many great choices and I appreciated that many were offered more than once so that I could balance out a schedule. It was difficult making some of the choices because there was so much being offered that I could see being useful in my classroom now, and to keep in mind for my future role as a librarian. The best session that I attended was Middle School Medley presented by Dawn Farrell and Alicia Garbelman from Lake Ridge Middle School in Woodbridge, VA. I can see many possibilities for using what they presented right now as a classroom teacher and in the future as a librarian. Other great sessions included: 150 Best Websites Selected by AASL, Using Twitter in Your Library, Using Pinterest As a Tool for Organization in Your Library, and The Contemporary School Story which was about using different novels with students that relate to some sort of standardized testing in schools and how the characters handle taking those tests. 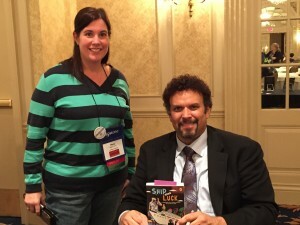 The opportunity to meet authors David Baldacci, Neal Shusterman, and Kimberly P. Johnson were high on my list of things to do. I am so glad that I signed up for these special events with these talented individuals. I am so glad that I had the opportunity to attend this conference and I am looking forward to attending again next year! 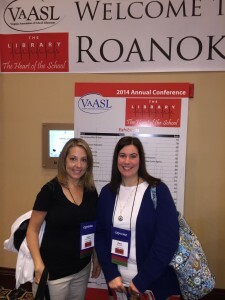 I attended the VAASL conference on November 6th and 7th. This was my first state conference. From breakfast with other first-timers to dessert with David Baldacci, I enjoyed every minute of it. I found the presenters and attendees to be a happy, supportive, creative group of women (and a few men.) It makes me eager to be part of the “librarian club.” The conference was well organized and I was impressed with the quality of the sessions. I learned about taking literacy beyond the library walls, makerspaces, using nonfiction for story time, parent/child book clubs, using iPads in the library, library volunteer programs and more. There were so many sessions available, it was hard to choose! I feel I have acquired a wealth of knowledge and resources to support me in my future library.